COLORS !!! Is the way I like to treat myself every day. I'm wearing again my favorite pair of Marc Jacobs sandals, this time with casual jeans, colorful bracelets, a striped top and my orange Benetton cardigan sweater. new neon outfit post ! 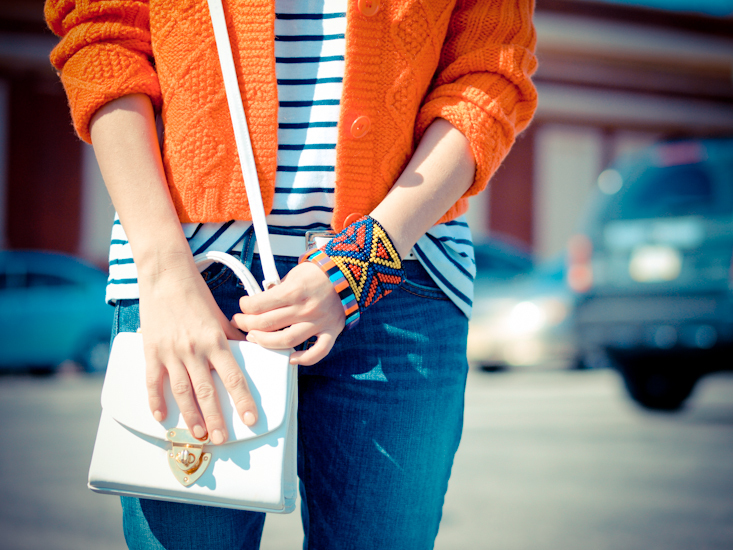 Orange, white and blue seems to be perfect combination! Lovely! Bag and cardigan are gorgeous! Everything works so well together! YOU LOOK FANTASTIC!!! 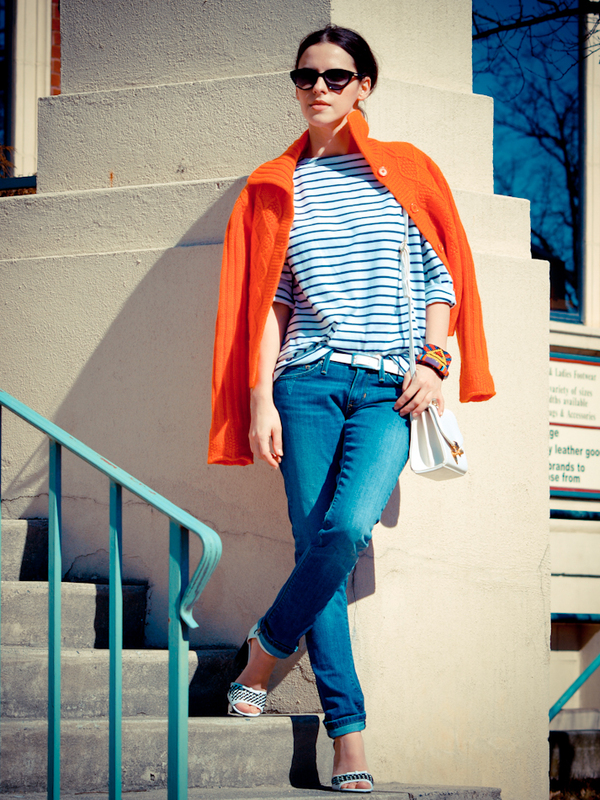 !sTRIPES+ORANGE+GREAT SHOES+YOU!!!! 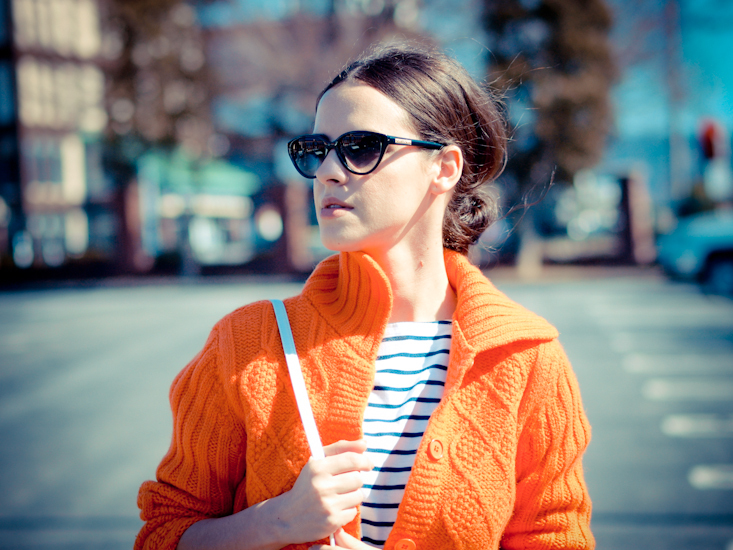 != A GORGEOUS STYLISHED GIRL/BLOGGER=WONDERFUL PERSON!!!! Love your outfit! The colour of the cardigan is great..and that bag, OMG it’s so adorable!! Those shoes are so great, perfect for that outfit! The outpouring of color in this look of yours is so beautiful and refreshing! Perfect for brightening up any wardrobe but you take it in a whole new level my sweety!! Sumptuous, modernist and so sleek!! 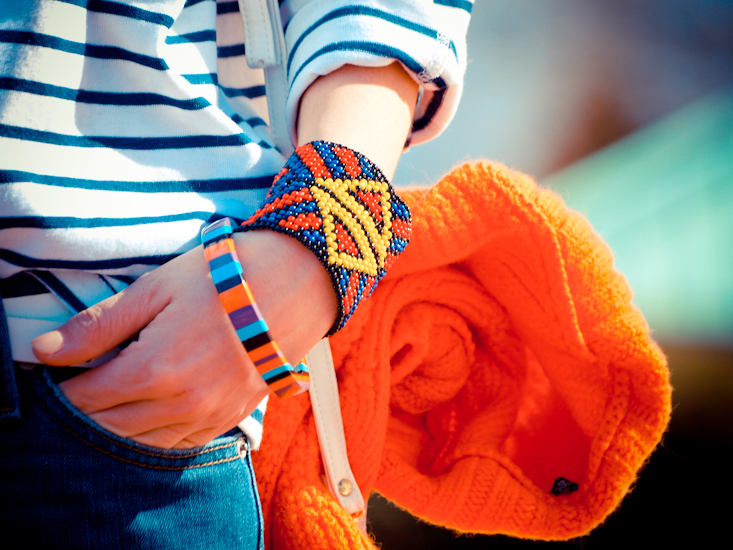 Love that sweater and bracelet! Buen dia Vero..las pulsera etnicas son hermosas..siempre con buenas novedades..besos !! Great color combo!Love the bag and the jeans! Loving you cable knit sweater! It looks so comfy and the color is amazing! Great look!Love every piece of it!!! … well u always doing it so great…such a simple outfit , but so bright, happy & well combined ! I love the bag! It goes so well with your outfit! The black and white photo is beautiful! What a coll outfit! Love the sweater! You are so the queen of orange – I personally don’t think it’s a colour everyone can pull off (including me), but you always look so amazing in it! Such a stunning look. So casual and stylish! I love the accessories. Awesome colour combo, very chic! I also adore all your accessories, the bracelets are beautiful and I just adore your sunglasses! This sweater is perfect and look great on you! you look fantastic! I like marine style and it looks great with orange! Omg! I love it from head to toes! Gorge outfit inspiration for this spring weather. wow!!! soooo perfect combination! <3333 love! I love these vivid colours! I love this colorful outfit! Beautiful bag and cardigan. I love these colors. 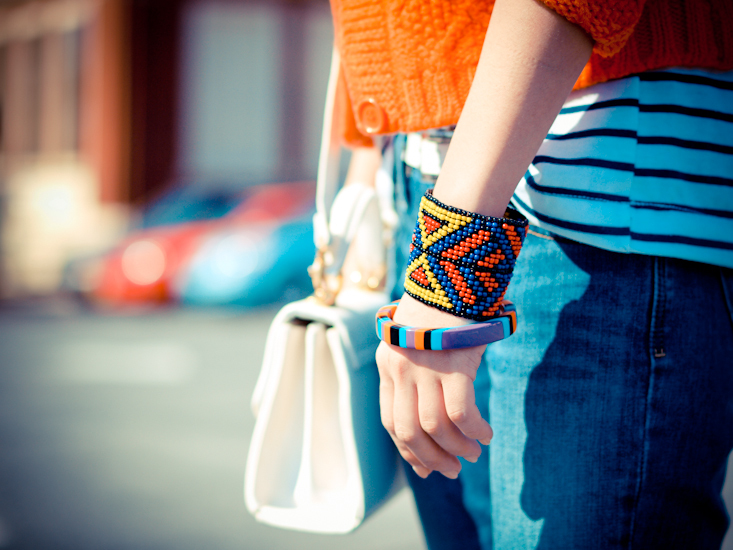 Lovely blouse and bracelets. Love this casual look. 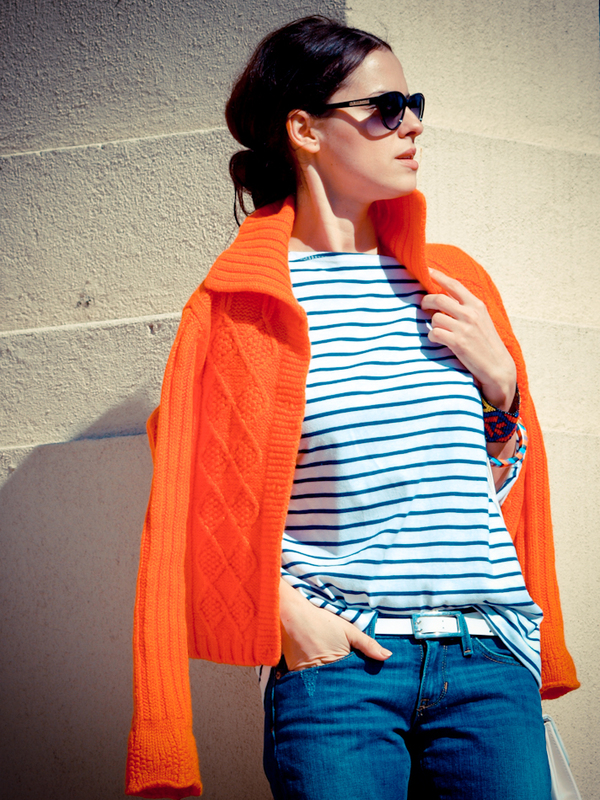 Breton stripes and bright shades is a great combination. you always look flawless! today is no exception. Lovin the whole ensemble. You really know how to put things together and such crisp pictures! Hello Veronica fantastic look Navy and Orange. love it.